To set the context of world events in late 1974, at least from a western ‘first world’ perspective, the last of the moon landings had taken place two years before and, while the Americans had largely withdrawn from Vietnam, Saigon was yet to fall to the Communists. Britain was beset by energy crises and the ‘population problem,’ the definition of which was vague. The Ken Russell movie Tommy, filmed in 1974, featured Roger Daltry of rock band The Who apparently launching from a castle tower near Portsmouth, England, in an all-white Birdman standard Rogallo. He flew shirtless and helmet-less while singing a long-forgotten song, thus causing dozens of mods and rockers on the streets below, some wearing World War 2 German steel helmets, to stop fighting and instead break out into spontaneous gyrations while they looked up at him in awe. The point is that, with the advent of hang gliding, you no longer needed to use a multi-million dollar airplane to drop napalm on iron-age villagers in support of a corrupt capitalist regime half a world away (fighting a brutal communist regime) to be a flying hero. 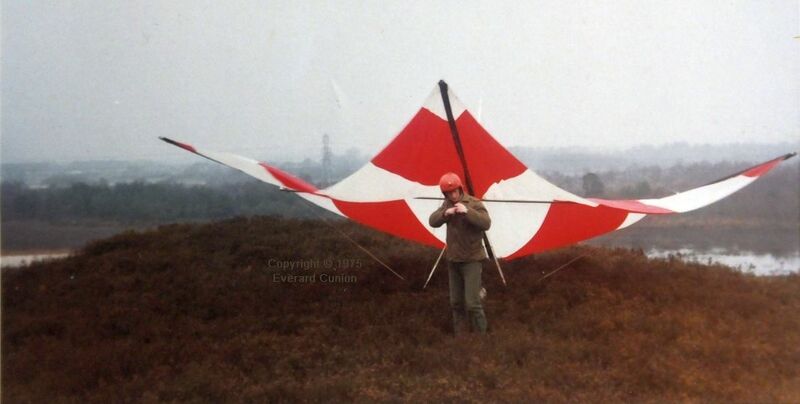 The Skyhook IIIA was a ‘standard Rogallo’ hang glider sold in kit form, originating from the industrial north-west of England. (Mine cost £160 in 1974, equivalent to £1,600 in 2018.) I built it in the autumn while I was studying for a Higher National Diploma in applied physics. The sail was fully made, as was the plastic-coated steel cable rigging. I had to cut the tubing to length, drill holes, and assemble it. I am sometimes asked what my first flight felt like. I cannot answer because I do not know how to distinguish between mushing and flying on my first attempts, in which I left the ground briefly with the wing largely stalled — and therefore not really flying — before either it dumped be back onto the slope or I careened into a bush or small tree. My first attempts consisted of running with the wing down a slope that was too shallow. Then I did the same on a steeper slope, but without enough wind… Eventually I discovered that I needed much more airspeed than I had imagined, whereupon I glided down the slope about a metre above the heather for a few seconds before flaring to a stop where the slope became shallower. My most memorable flight there was when I was alone, strapped in to the seat harness, with the wing parked nose-down below the top of the heather-covered slope. With a cold 20-knot north-east wind bearing down on the sail, I had to haul back on the top of the control frame to get the nose off the ground, then carefully raise it to a position where the sail rattled and banged with the wind passing equally over and under it, shaking the airframe. While maintaining that pitch attitude, I picked up the wing by the control frame, the harness straps alternating between tight and loose as the whole rig jerked about. I took a quick look around — nothing seemed wrong — and I raised the nose a degree or two more, whereupon the sail went taut and it catapulted me skywards as I held on, pulling in for speed and shifting sideways first one way and then the other to counter the turbulence trying to turn me. I was levitated upwards, initially making no forward progress, but fortunately holding station against the wind. I was too overwhelmed to be terrified. The accompanying photo shows the same slope as that over which I made my first flights in 1974, but this photo was taken in February 1975. At the apogee of that three-minute sub-orbital lob, I took a moment to look around. Immediately below and to the right, the tan and sandstone red quarry that was one of our main motorcycle and bicycle trials riding patches, with the main access track leading off along the top of the hill lost among trees towards home. To the left, the rest of the forested hill with its several saddles, separated from its farthest ridge by the new A338 dual carriageway with its tiny vehicles and, beyond that, the airport’s rectangular yellow school of air traffic control and its runways. Then I looked behind me. New houses had been built on what used to be a series of tree-covered ridges and farther down, partly hidden by trees alongside it, the main road into and out of Christchurch, almost as busy then as it is nowadays. Soaring conditions were the best ever; the flatlanders loved it as they rose effortlessly like ashes in a column of smoke a thousand feet above Edwards Canyon. About my taking a quick look around before launching: I knew even then to search for the unexpected. On more than one occasion — fortunately when there was little wind — when rigging the Skyhook IIIA, I accidentally caught a fold of sailcloth between the plastic saddle washers where one cross-tube end joins the leading edge. (In retrospect, the rigging procedures of those things were not well designed!) It all looked OK, but when I launched, the glider turned me into the hill and I slewed to a standstill in the forgiving heather. Had such a thing happened on launch into a 20 knot wind, the result would likely have been dire. I became aware that hang gliding was not like off-road bike riding where, if you came off, your chances of being seriously hurt were slight. I had already been hospitalised before even getting off the ground. Have you ever seen the workings of a knee joint — your own — between the exposed thick skin and muscle of a horizontal gash? I do not recommend it. Sometimes pilots attempt a three sixty in front and below the cliff and end up misjudging the distance. They would plow into the sheer wall with a twenty-five mile an hour wind pushing their thirty mile an hour glider at fifty-five miles an hour ground speed. It was like a fly hitting a windshield on the freeway. The pilot’s body took most of the impact, the wing tore and slid down the cliff side in a twisted mess of broken tubing and flapping sail with not even a scream coming from the pilot above the noise of the pounding surf because his brain had been smashed. 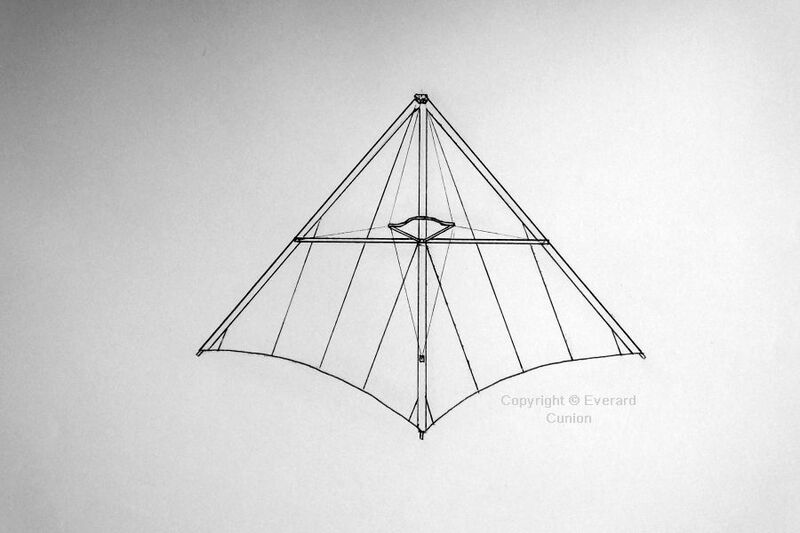 The Icarus II was an early rigid biplane wing hang glider designed by Taras Kiceniuk, who went on to develop the Icarus V monoplane. 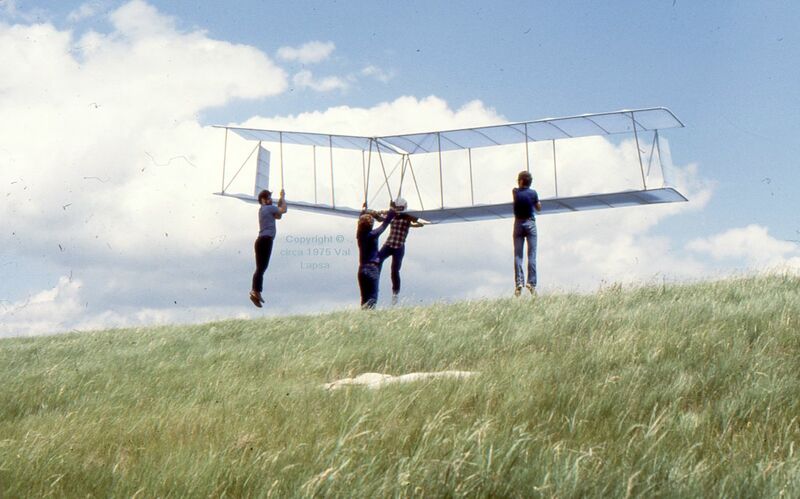 In Canada, Val Lapsa and some friends built and flew an Icarus II. Resting on his shoulders was a great frail set of snow-linen wings, thirty feet from tip to tip and casting a transparent shadow on the grass. He took a breath in readiness, reached forward, and gripped the adhesive-taped bar of the main wing beam. Then all at once he ran forward, tilted the wings upward, and lifted free of the hillside. Val’s glider eventually crashed and was unrepairable, which was one of the drawbacks of these higher performing but more complex wings. The Icarus II was further developed by Ultralight Flying Machines and renamed Easy Riser, in which guise it became popular as a powered ultralight. See Easy riser, my review of the 1995 movie Fly Away Home for more of the Icarus II, both as a glider and as a powered ultralight. TOMMY (1975) Sensation [1080 HD] Video clip on YouTube from the 1975 Ken Russell movie Tommy. Birdman’s Dave Raymond did the flying, but the cuts to close-ups of Roger Daltry of The Who hanging in the glider suspended from a rig were seamlessly edited. This is fascinating–are you still hang gliding? It’s a sport I have always wanted to try. The only true flying that we humans can do, it would seem. I love its simplicity, its cleanliness. I can imagine a push-off, then lift, then…the surrounding. Being enveloped in whole new medium of yaw and pitch and roll, but without those words. Would I wind up killing myself if I just up and bought a glider? “Would I wind up killing myself if I just up and bought a glider?” — Yes! You need to get trained at a hang gliding school. You can find a list on BHPA.co.uk. Paragliding is easier to learn and is more popular than hang gliding, but I stopped paragliding a couple of years ago to concentrate on hang gliding, which is where I started really. I taught myself to fly back in those years. I learned on sand dunes at the beach. I believe it is the ONLY place to learn! My present craft is a Solairus ATF. Wow, memories. 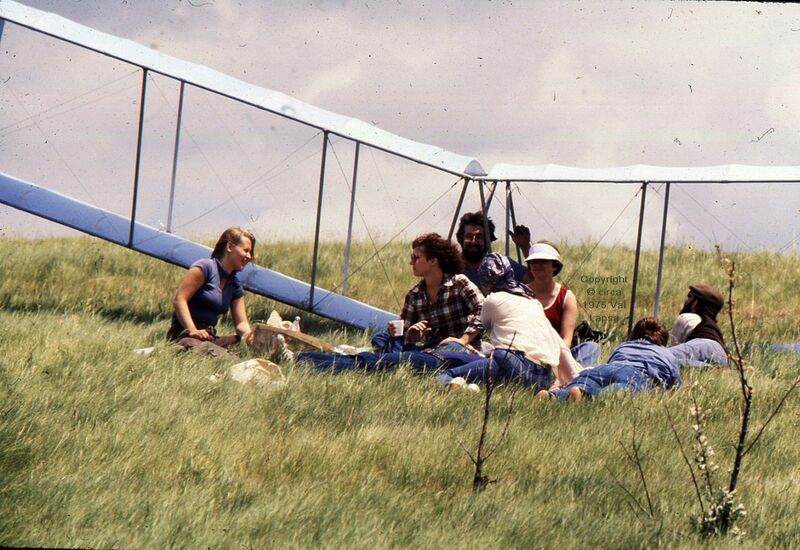 I flew a Ridge Rider on the south downs, was at the Minto championships, and later had a Chargus Vega. Happy days. 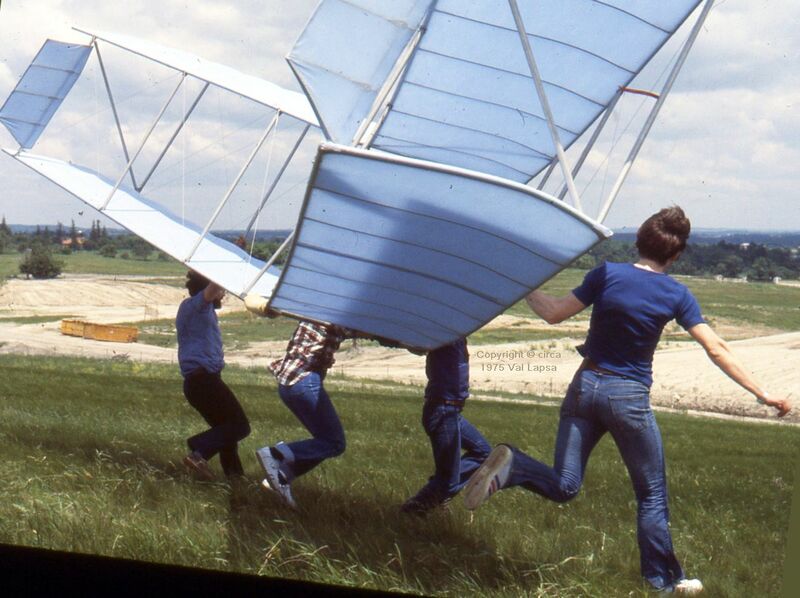 In regard to pitch problems in 70‘s gliders, in my experience the most common one was that there was simply too much, leaving two usable speeds for a prone pilot: trim and elbows locked. 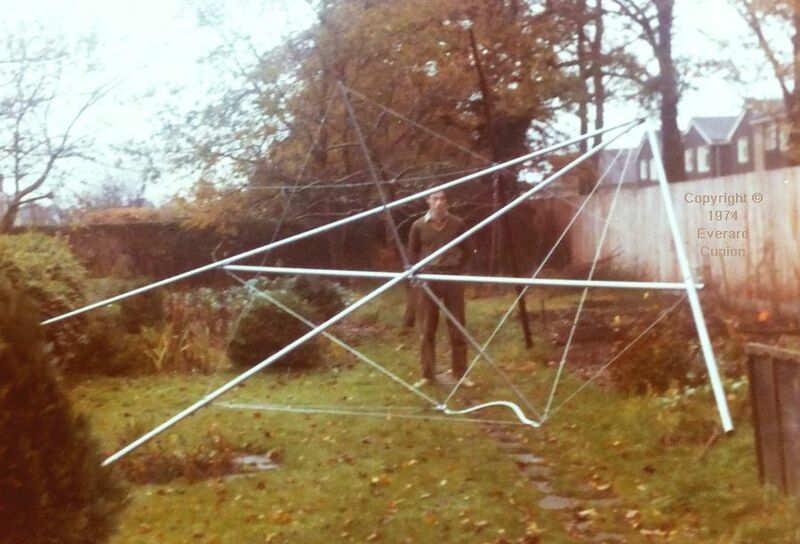 In my early days on a Sky Sports Lark (a “standard”: Low Aspect Ratio Kite) preflight did include sighting down the keel for a certain amount of reflex, and if lacking, a twist of turnbuckle could bring it up to spec. My one occasion flirting with pitch divergence was when I sent my Sirocco II off for an upgrade ostensibly to improve handling. Standing keel pockets were in vogue and Sky Sports had come up with a retrofit that bent down the keel, added a small post where a keel pocket would be, and put two pulleys on the out and down deflexor wires at the nose. The bent keel required shorter flying wires to the keel. Well an error was made on my glider where they used the length of the smaller size Sirocco. End result was a glider that flew with negative bar pressure and was quite terrifying. My instructor was skeptical – that is until he flew it! 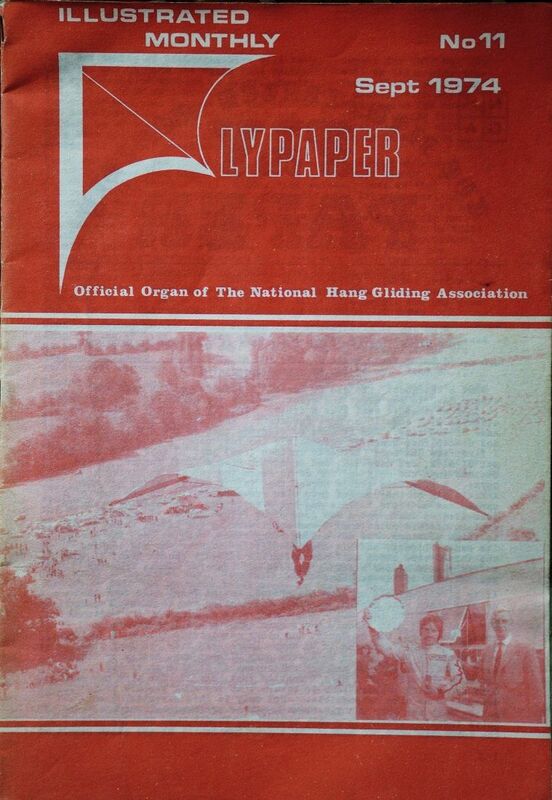 For more of Chris’s experiences of the early days of hang gliding, see Flying squad, my short history of the east coast U.S. hang glider manufacturer Sky Sports. I had a LARK as well! Learned to fly it here on Cape Cod.